How to find my realm file? 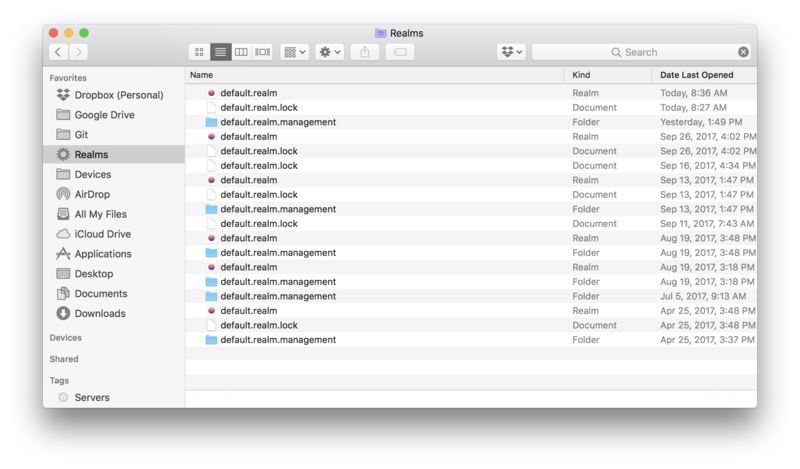 I have created a DB by realm and I am not able to find the file as my OS (Yosemite) dont have a mobile folder in the /private/var/mobile. How should I access my realm to run in the browser? How to view my Realm file in the Realm Browser? Make sure that your device is connected and go to the devices window in the Xcode menu Window > Devices (⌘⇧2). There you will be able to choose your device and your app from a list of installed apps with debugging permissions. After selecting your app, go to the cog in the toolbar at the bottom of the table view and select “Download Container…“. There you will be able to pull the file from the documents location to your Mac. It will be saved as an xcappdata bundle. When you open the local path in Finder, where you saved it, you can tap into that by selecting “Show Package Contents” in the context menu of the finder, when you select the file. A new finder window will open, where you find your Realm inside in the following path (e.g. ): AppData/Documents/default.realm (The directory '/private/var/mobile' is the path, which is used by iOS on the device filesystem. This is probably the fastest way to find the file of an app in the simulator. Install SimPholders. This will allow you to access your app’s documents directory directly from your menu bar. Then x code will log the correct path, check the screen below. Here is an easy solution.. I messed with this for awhile. I should point out, this is a specific set of instructions using Android Studio and the AVD Emulator. 1) Start the Emulator and run your app. 3) Click the File Explorer tab in the Device Monitor. There should be a lot of folders. 5) Highlight the file, click the Floppy Disk icon in the upper right area "pull a file from the device"
6) Save it off to whereever you want and done. Create a smart folder/search in Finder. Gives quick and easy clickable access to all your realm files. 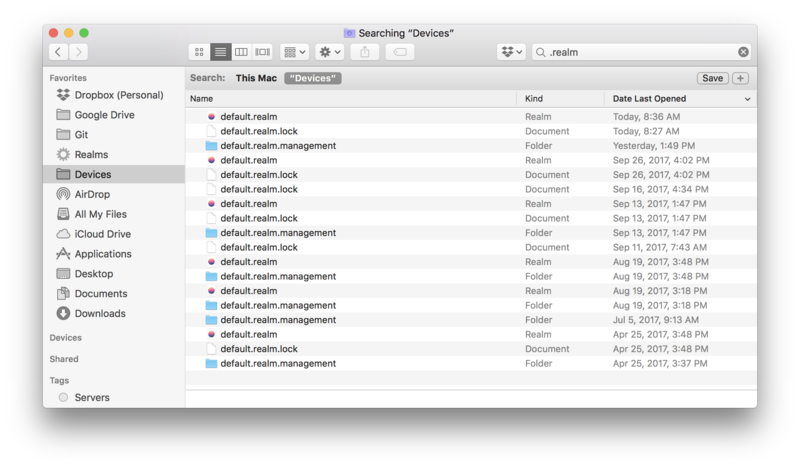 Open the folder /Users/$USER/Library/Developer/CoreSimulator/Devices in Finder. Change the search to look in the "Devices" folder only. When sorted by date this will give you a quick and easy clickable list of the latest modified Simulator .realm files. and then it gets created in full view on my desktop and I can double-click to launch the Realm Browser on it. Later, I can remove the parameter and let it use the default location when I'm satisfied that all is working as expected. This is the simplest command you can run to get your path to .realm file. You will see the .realm file after all your read and write operations are completed. 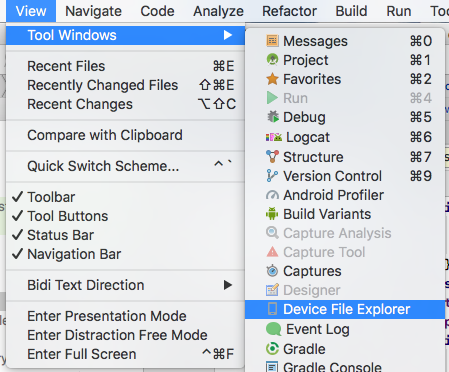 First open "Device File Explorer" in android studio(View -> Tools Windows -> Device File Explorer. This will open your device explorer. default.realm is the file for which we are here. Now Save_as this file at your location and access the file from the realm_browser and you will get your database. NOTE: Mentioned approach is tested on non-rooted phone(one+3). 'default' could not be opened. It may be encrypted, or it isn't in a compatible file format. If you know the file is encrypted, you can manually enter its encryption key to open it. First, I acknowledge that this is an Android thread but it is the first search result for this issue in general. To open the most recently created Xcode Simulator Realm db in Realm Browser you can use this script in Automator or type it all in at the terminal. By using Automator, I have one-click access to my current realm. Install Realm Browser. In Automator, click New, select Run Shell Script, paste in code, change Realm Db name, Click Run to test, save file somewhere convenient for quick click access. I don't know where I found this tip the first time but this thread reminded me how I was accessing my live data in the past. var dev: Bool = false // when I want to run on my device or upload to app stor. So when in development mode, I can find my realm database on my desktop and can open in Realm Browser. I found my realm file by issuing this command in Terminal: sudo find / -name "*.realm". The correct (lldb) command is: Realm.Configuration.defaultConfiguration.path. And under File Explorer. Search for the apps. And the file is under data/data. The correct lldb command for Xcode 7, Swift 2.2+ is po Realm.Configuration.defaultConfiguration.path! The .realm file should be inside "Documents"
Not the answer you're looking for? Browse other questions tagged realm or ask your own question. How do I view my Realm file in the Realm Browser? How do I create my .realm file/database using the model I've just made in XCode?